Get a recap of news from Arizona's win over Oregon. Trier has 10 points, five rebounds and two assists at halftime. Solid half of basketball. Dont let up Cats. Keep it going and Bear Down! How many fouls on Brooks? Go at him cut the head off of the snake. Keep going to the boards! We got back into the game with those quick fouls Oregon got called on in a short amount of time. We were down 5-1 in fouls at one point. Oregon can't afford to get more fouls in the pay early on. Time for Lauri and Zo to take over! Our fans need to drown out the Duck fans all the way to the end. Just like we did to the Bruin fans last night. Give our guys a little extra lift! Still don't fully understand starting Pinder. But I do like that it shows our depth. Got that right Lauri only got 2 shots I think. Shoot Lauri Shoot! I'll take another half like that. Get Lauri more shots. Wow, what a half. Hope the Cats come out like they did last night to start the half. Just shows how much Sean wants this one. The roof is the ceiling with this team! Weird half. 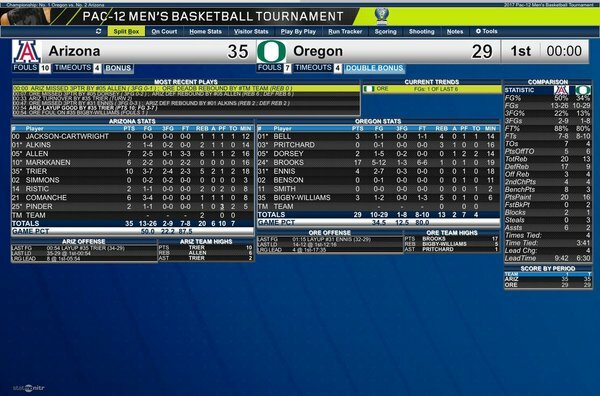 Arizona has 7 turnovers, Lauri Markkanen has attempted two shots, Dillon Brooks has 17 of 29 Oregon points. UA up by 6. How was that not a foul on brooks? Trier just basically threw the ball out of hands. 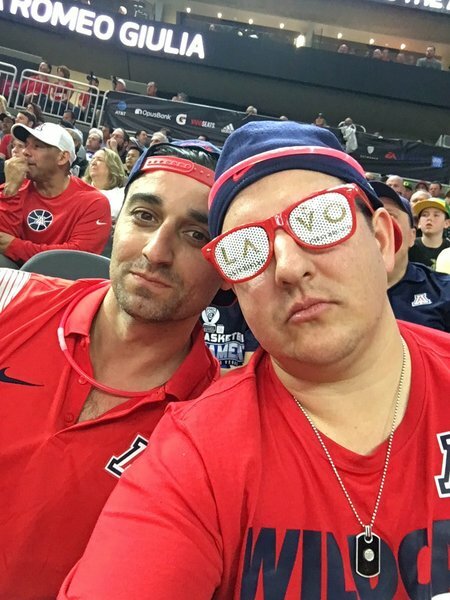 Sean Miller is in disbelief. So am I, actually. Trier is the first Wildcat in double figures. He has 10. That play was beautiful. Textbook hoops. Trier with a very impressive and-1. How do you have three seven footers looking at each other as Oregon grabs the offensive rebound? Rawle gets his first points to end Arizona's scoring drought. Simmons shouldn't be let on the floor NO MORE!!!! I don't know what these refs are looking at.